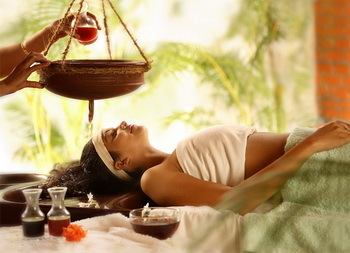 Ayurveda is the ancient Indian system of natural healing that is only beginning to appreciated and put to use in the West. Ayurveda is a method of treating the whole person rather than just the disease, on physical, emotional, and spiritual levels. The Ayurvedic tradition links the development of PCOS with eating of too many "kaphagenic" or sweet and juicy foods. As the digestive tract becomes overwhelmed with sugar and fluid, a long-term weakness making it impossible to process sugar sets in. PCOS can, in the view of the Ayurvedic masters, also result from a search for an emotional "sweetness" caused by lack of love or lack of contact with the inner person. When these changes occur on the inside, certain symptoms begin to appear on the outside. There can be a little weight gain, or maybe a little downy growth of hair in unusual places. This is followed by changes in appetite and maybe pain during ovulation. Then there might be heavy menstrual periods, or no period at all, or unusually long menstrual cycles, or unusually short. Two different women who have PCOS may have entirely different patterns of secondary system. In a symptom pattern Ayurveda refers to as "kapha," there may be weight gain, high blood sugars, cold hands, cold feet, hairiness, and infertility. In a symptom pattern Ayurveda calls "pitta," there may be menstrual cramps, high blood pressure, heart problems, and acne. In "vata," there may be weight loss, extremely painful periods, and unusual timing of periods, sometimes coming too soon and sometimes coming too late even when there is no pregnancy. Diet is key to controlling the kapha pattern. Meditation and gentle exercise are needed for pitta. Hormone-stimulating herbal preparations or medically directed hormone replacement are needed for vata. Choosing the right herbs and the right exercise or meditation practice is something that really needs to be chosen with a healthcare practitioner who has a strong background in both traditional medicine and natural Ayurvedic healing. If you do not have access to such a person, however, consider how the patterns of Ayurvedic disease and healing can point you in the best direction for overcoming the symptoms of PCOS soon.